Have you ever wondered what would happen if you had these fun, seemingly disparate items and had the opportunity to make whatever you wanted with it? 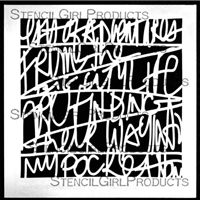 Let’s say we start with stencils from StencilGirl. Thenadd black, white, and natural Kraftex by C&T Publishing and make some magic happen. 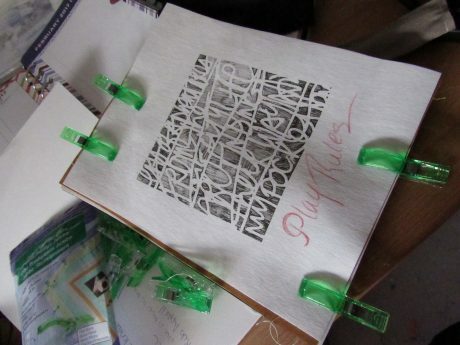 Kraftex is a craft fabric paper that is sturdy, can be stitched, washed, drawn on, painted on, oh! the possibilities are endless. Now, what to do? Thinking! Thinking! Imagine smoke billowing from each ear as the ideas run into the burning flame of creativity. Each one good: a quilt, a stitch book, a tote bag, a purse, a zipper bag for carrying pencils. 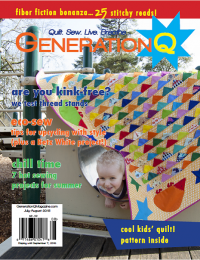 See what we mean here Q-bies, endless possibilities. Oh how to decide. 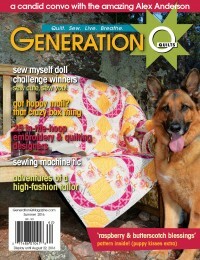 So the quilter wants to make a stitchy design book because why not? 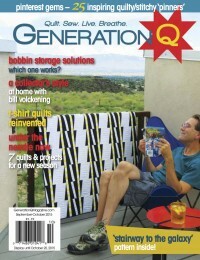 So I pick a size that seems oddly familiar 7” x 9” the size of Generation Q Magazine. Using the rotary cutter and a 6” x 24” ruler the pages are cut and set aside until they’re needed. 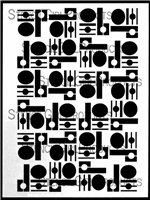 One sheet is cut at 7” x 18” (width of Kraftex). Using the Pounce marking powder and the top stencil I mark the 7” x 18” sheet, add a layer of batting, and start stitching. I opt not to use a backing as I have plans to stitch a plain piece of Kraftex later. So with plan one fully abandoned what to do what to do? Oh I’ll make a sketch book, because, yeah, that’s easy. But first let me make a zippered pouch to carry color pencils or pens for drawing, change, metrocard, or some other kind fun stuff. 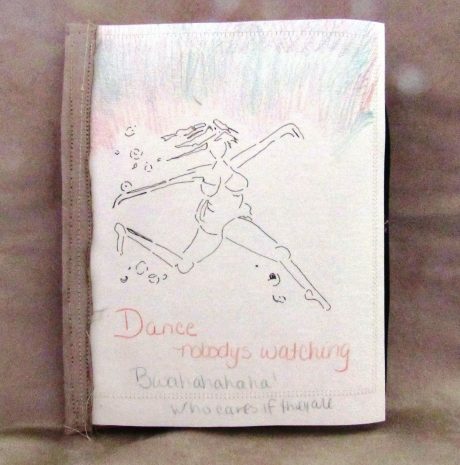 A quilter’s gotta dance in the rain so a little tracing with a sharpie made quick work of the cover. For the sky and quote color pencils worked just dandy. Arranging the pages took a little bit of thought only to figure out exactly where to stitch in the zipper pouch. Decision made it would go between the last two pages. 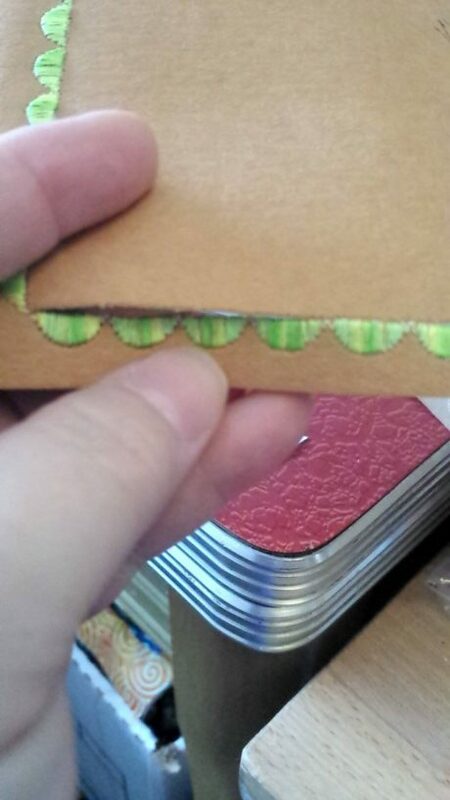 Next decision, how to hold the pages together while I stitched them together. Wonder Clips to the rescue! Oh but wait! There’s some faux suede over there, why yes that’ll do the trick and make a great binding for the sketchbook. A quick work of stay stitching will assure the suede won’t fray and give a wee bit of a decorative look. Breathe deeply and start stitching. Stitch. Stitch. Stitch. Gotta admit that the level of fear was a wee bit high as I started stitching through all of the Kraftex. A top stitch needle, a longer stitch length, and 40 weight polyester thread et voila! It’s all good. Note, a stitch length that is too short will perforate the paper. 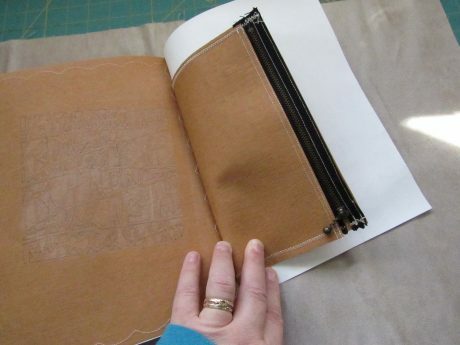 Well several lines of stitching to make sure the book is secure. Oh and one more thing. The back cover had to be awesome, the Travel Notes Stencil and a color pencil at our service, thank you very much. It took a little bit of time but the end result is so fun. 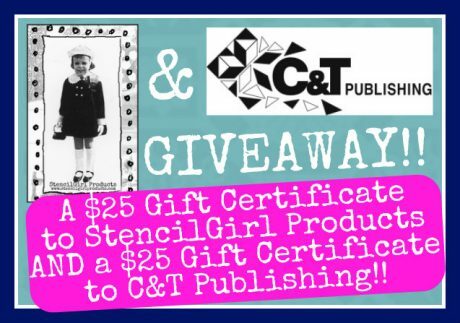 AND a $25 Gift Certificate for C&T Publishing!! Visit the fabulous designers from both teams and comment for your chance to win! You have until Saturday, February 18th at 11:59PM Central Time to leave your comments. 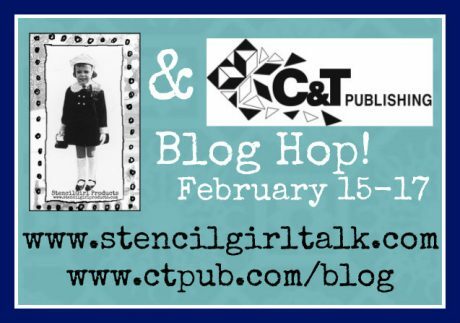 StencilGirl’s Facebook page and C&T Publishing’s Blog on Sunday, February 19. What a delightful sketchbook! Love everything about it…especially the zippered pouch attached! So creative and inspiring! That looks like so much fun!!? This is so humorous! Love it. OK, I was really struck by the first project you abandoned, but the second was great too!! Thanks for all those tips! and I love the stencil of this woman you used. Such a fun and free project!! LOVE it!! What a fabulous sketchbook! I love that you included a pencil pouch – that’s so handy! This is awesome!!! I’d love to make something like this for my daughter as a gift!!! Thanks for the tip about stitch length. I’ve seen Kraftex before and I never thought to make a book with it. 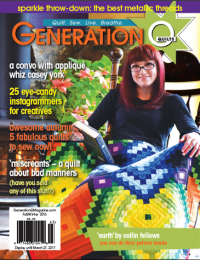 Very clever use of this material….love how you showed that…oops….with short stitching. We will all keep that in mind when working on our own KraftTex projects. Another great project! Love this material. Very cool! Thanks for the great ideas and tips. Looks like fun. I do like how strong it appears to be. Thank you for the inspiration. I like the zippered pouch you included! Very cool. Thos wonder clips seem great for holding book pages. Hmmm, must investigate. I love that you have your pencil pouch right there too. Thank you. I need to check that paper out. Amazing. I love the green scallops. What a perfect finishing touch! I love stencils so this would be great. This is a very nice project. Cannot believe I am first comment again! 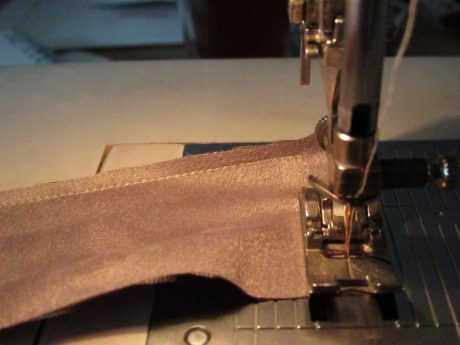 Thanks for sharing – I am always in awe of any sewing project. great experimenting. thanks so much for sharing. Stitching the bag into the journal is such a great idea! Great ideas – thanks for sharing! Thank you for sharing the needle size & stitch length… might make a travel keep sake notebook for our first ever out of the country trip. Thanks!!! Still not sure if my two previous attempts at commenting worked, so I will try one last time…. medium is fantastic. Love your pouch. Looking forward to trying Kraftex. Stretching yourself and trying new things – and getting an awesome end product. Well done you! Fun project! Thanks for the stitching tips! 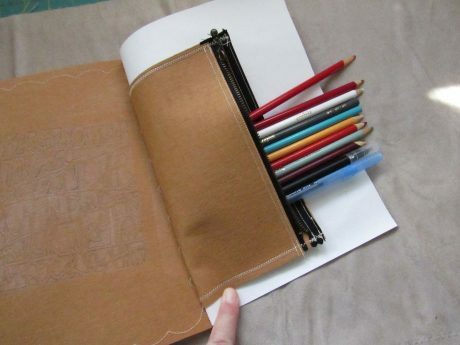 Great idea for a travel sketchbook, I’ll be needing one soon. What a great idea to include the zipper pouch!!! 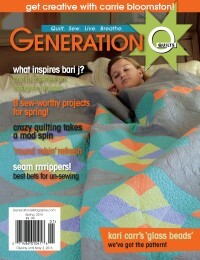 As one quilter to another… way cool! Wonderful work here, I am so enamored with the Kraft-Tex. Would love to see the cover! Your stitched scallop is adorable! 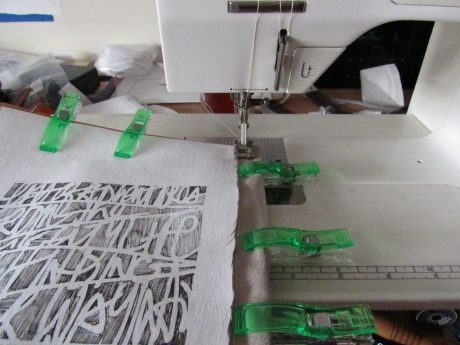 Thanks for all the technical sewing information…I have been wanting to stitch my paper works but haven’t used a sewing machine in over 20 years!!! Maybe this is the inspiration I needed. Thanks for sharing! This was interesting. Thank you for sharing! Interesting way to keep the writing sticks with you. Neat project! 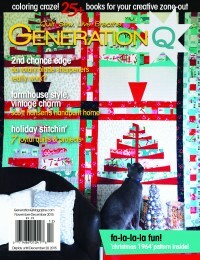 Loved the quilted set-aside, too! This is awesome! 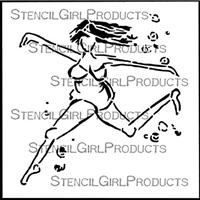 Love the Loose Woman stencil! Like the idea of adding a pouch to the book, a few more photos please! I love journaling, and your book is so cute!